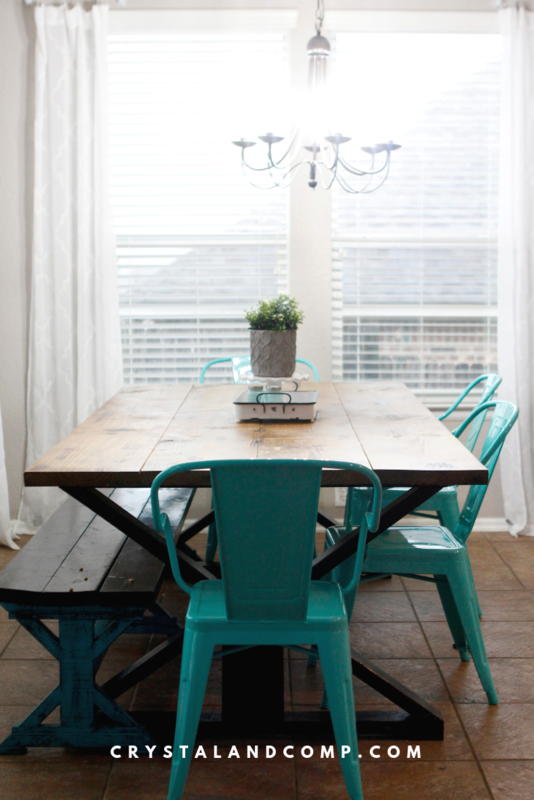 Clutter can be absolutely debilitating and something that takes over your life. I know, I’ve been there. You likely feel overwhelmed all the time. I am going to share my best tips with you for how to declutter your home. We are a large blended family. We currently have six kids at home, all boys. We have three grown children as well. For over a decade we raised our large family in a home that was 1800 square feet. That is with the garage being converted to add two extra bedrooms, an extra bathroom and a decent sized laundry room. But, as you can imagine, 1800 square feet is not a lot of space for a family our size. Clutter creeped into our lives over that decade of blending and growing our family. This past year we moved our large family to a home that is 3800 square feet. It has been a blessing to have space for everyone and every thing. We homeschool so our kids are home all day long. It’s so overwhelming when everyone is on top of each other. While we don’t have a space problem anymore, I worry about clutter creeping into this house. I know I have to stay on top of it. Here are some tips on how we decluttered before we moved and ways to make changes in your life to keep clutter at bay. Hear me out. Once you get your house decluttered you will be more productive. The clutter in your home is cluttering your life and your mind. Clutter will affected you in every aspect of your life. Trust me! Here is a list of things you want to ensure you have on hand as you begin to declutter. Honestly, if you need help reach out to someone. My mom helped me a lot. So did one of my sister-in-laws. Here are the “rules” I want you to keep in mind as you go along. Call them guidelines if you want so you don’t feel so constrained. Just keep them all at the front of your mind. 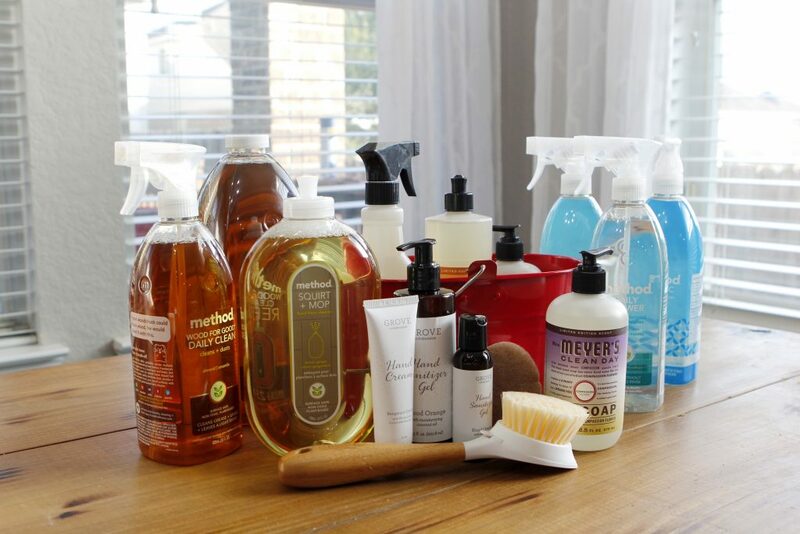 Here is a look at some of the specific cleaning items I use in my kitchen and other places in my house. Start in 10 or 20 minute chunks, tackling small areas. Don’t bounce around from one project to another. Stay on one decluttering area until it is finished, or until you have reached your time limit. If you can go longer, do so. Begin on the room where you spend the most time or where you can get the biggest win. If the majority of your time at home is spent in the living room, decluttering this area first will provide the most benefits and the biggest win. When that room is finished, focus on the next room that will bring you the biggest win. Always remain realistic. Let’s face it, if you have lived in a cluttered environment your whole life, you realistically will not be able to declutter over a weekend. It’s like water on a stone, you just keep going. Do the next thing. Be proud of your accomplishments. Remember that over time your daily efforts will pay off in a really big way. Have a family member whom you do not feel judge by be an accountability partner for you that you can check in with weekly. Send them pictures of your success each week/day. This is hard, especially for blended families. We all want to keep everything. There are emotional attachments to all of our things. We all want a piece of control and a sense of control. Many people struggle with what to keep, what to get rid of and what to donate. This is an area that can bring us right back to step one if we are not aware of these areas. Let’s take a look at some simple tips that will help you how to decide whether or not you should hang onto or discard something. Is it broken? If so, is it worth fixing? Has this item been used in the last year? If not, will it be used in the near future? Honestly if it has not been used in the last 3 months it’s worth considering that you donate it. Would it be expensive or difficult to replace? Am I keeping it because it would be harder to get rid of it? Would I prefer this item, or would I rather have the space it is taking up? If I were moving to across state (like we did) would it be something I would take with me? Is there someone who can enjoy this item or benefit from it more than I am? Do I have other things that serve the same purpose? Is it even practical anymore? The best way for me to ensure that I always have cleaning supplies on hand is to order them online and have them delivered to my front door. I have been a Grove customer for years. My favorite things to order from them are Mrs Meyers, Method and Grove. Here is my order for January month. I love that they pay attention to the things I order and remind me when I am about to run out so I can ensure they make it on my next order. Grove has an amazing offer right now through the end of January. 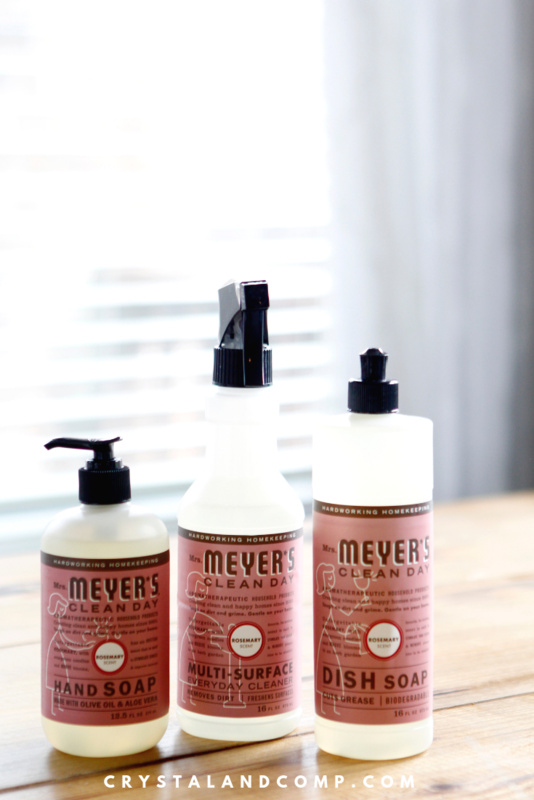 You get three free Mrs. Meyer’s products, a Grove brand caddy, a Grove brand scrubber (these things are awesome! ), free shipping and a free VIP trial. I chose the rosemary scent. I also love the basil, mum, peppermint, orange clove and peony. The last four scents are seasonal, but rosemary and basil are my trusted standbys. The caddy is super awesome for keeping under the kitchen sink or bathroom sinks so you’re not running all over the place looking for cleaners. I have the scrubber and it’s a great product. 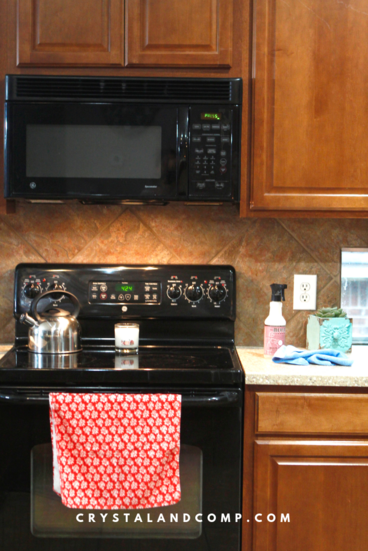 As you declutter your kitchen these will come in very handy! 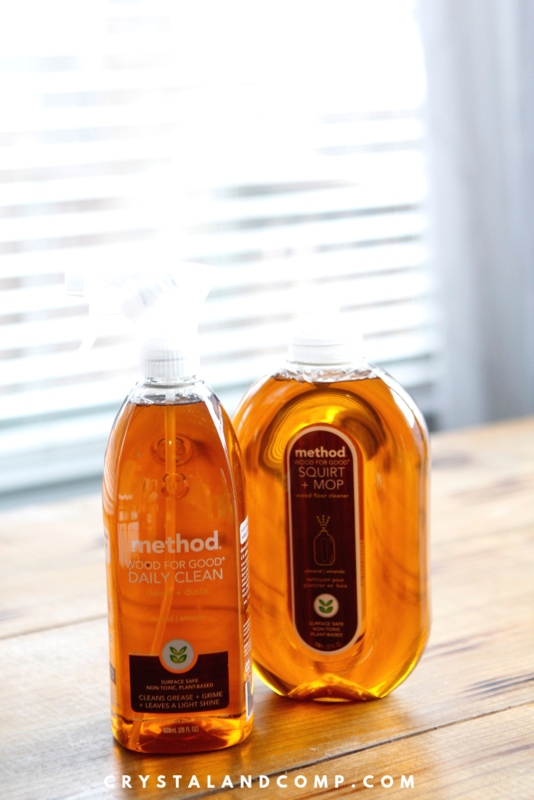 These Method wood cleaners are AMAZING! The prices are cheaper on Grove than buying them at Target and the free shipping makes it a no brainer. The spray bottle on the left is what I use to clean my farm style kitchen table. It’s like it conditions as you clean. No stripping your wood. And it has a clean almond scent to it. The squirt bottle on the right is the same scent, but it is for cleaning your wood floors. No diluting, you just squirt it on your floor and mop it up. My floors look amazing! I go through one bottle of the table cleaner per month and I actually have a refill for the floor cleaner that I buy every other month and it refills the squirt bottle 2.5 times. 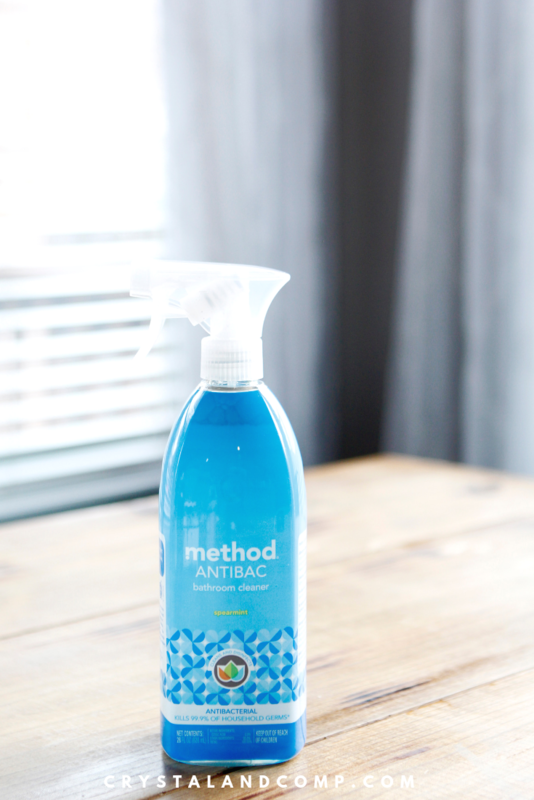 This antibacterial bathroom cleaner…. 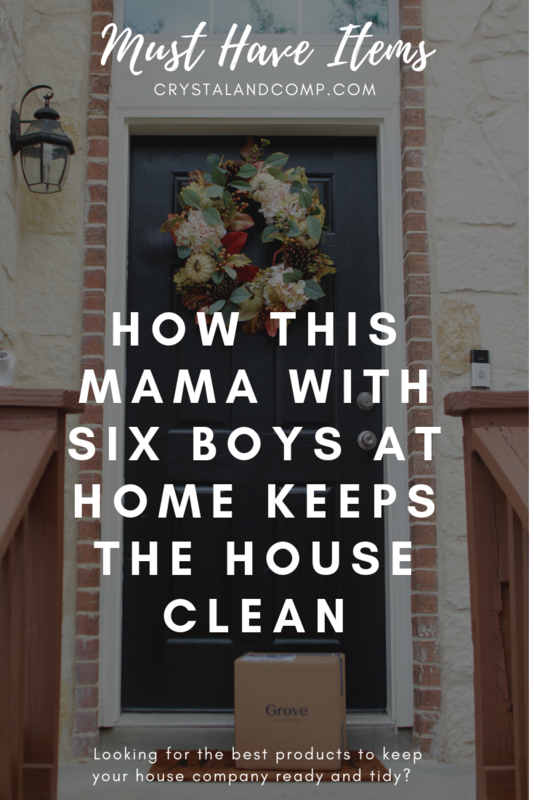 I have six boys at home. Need I say more? I hose the toilet seats down with this multiple times a week in all four of our bathrooms. I also spray down the floor and the base of each toilet with this. LOVE it! 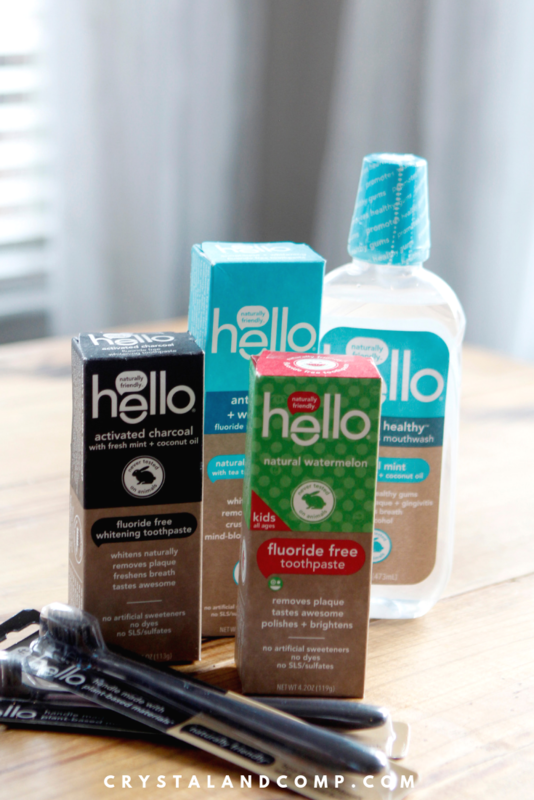 This month was my first time to try Hello toothpaste and mouthwash from Grove. I have wanted to try charcoal toothpaste for a while and one of my 12 year old twins is obsessed with mouthwash and toothpaste. I bought the spearmint mouthwash and toothpaste for him, the watermelon flavor for the 2 and 4 year old to share (no fluoride) and the charcoal for me and my husband. This is not something that is typically on my order, but I thought I would give it a try. As much as I can streamline by purchasing online with free shipping, I am happy. This was my freebie this month that came along with my purchase. 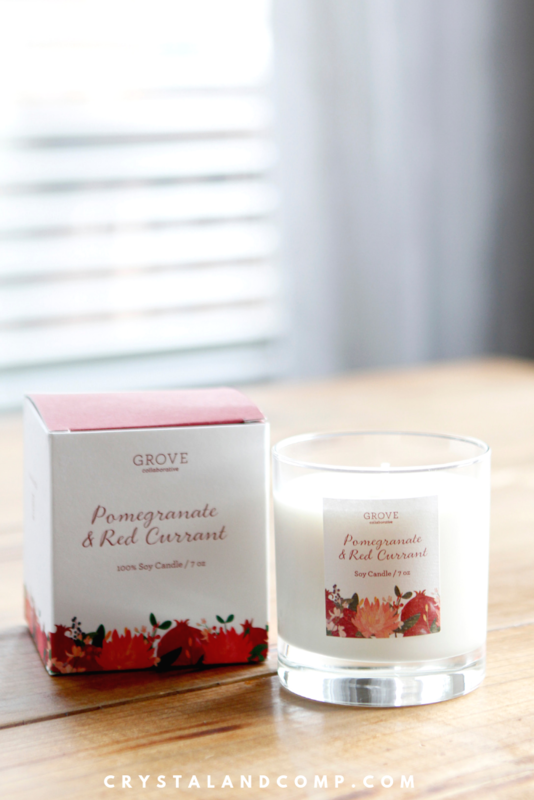 Every clean decluttered house needs a great smelling candle. There were other things in my order like the all natural deodorant, Grove cleaner, a scrubbing brush to use on the grout for the tile floors in the kitchen and bathrooms. 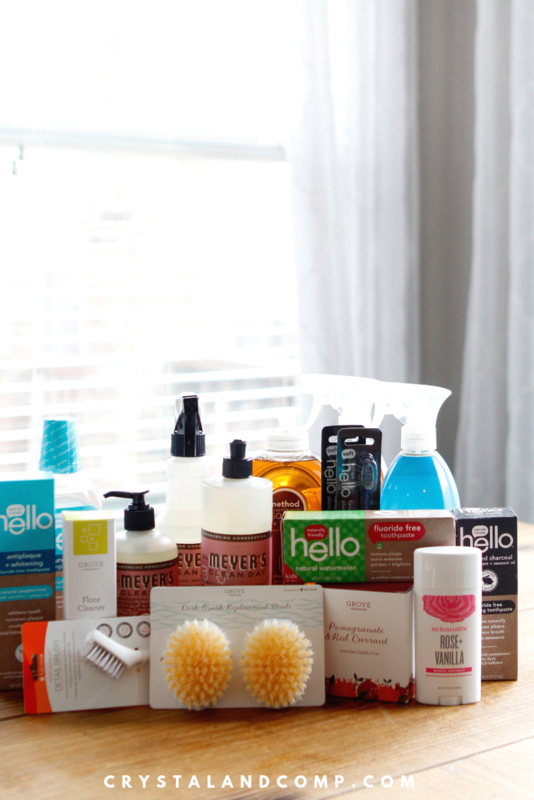 Get started with Grove here and get all the freebies! Here is my Grove unboxing from last month to give you an idea of what that looks like. I also share some of my clutter concerns, fears and story in the video. I created these checklists to make it easier for you as you work to declutter. 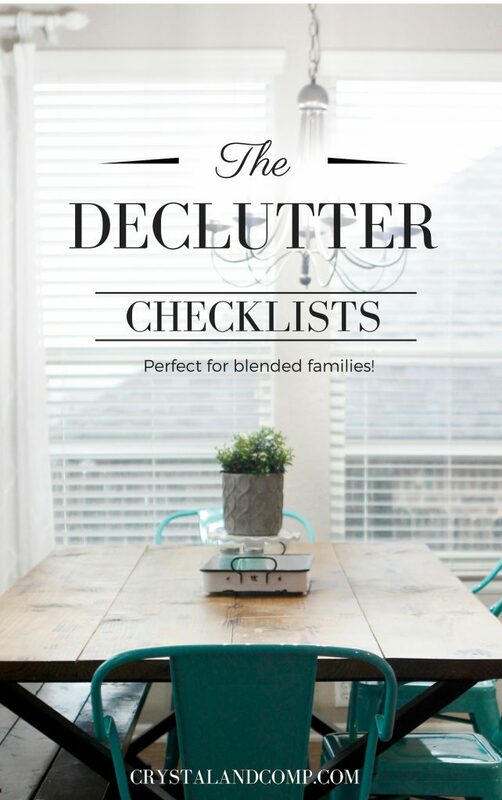 These are made with blended families in mind, but they work perfect for anyone who is struggling with decluttering and getting things in order in their lives. Click here to download these checklists and to be added to our cleaning and organizing list.